I usually love the whole 'Review of the Year' thing that you get endlessly in December, but I just can't face it this time round. It'd be like watching your house burn down and then volunteering to relive the whole experience on DVD. BUT! If Donald Trump or Nigel Farage or the Grim Reaper think that they will stop me reviewing the National Trust scones of 2016, they can think again. This year we visited 48 properties that we hadn't been to before and 17 of them won the coveted Scone d'Or for their five star scones. 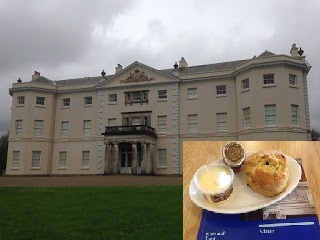 Never let it be said that the Scone Blogger eases herself into things where NT scones are concerned. No sirree. My first trip of the year took me all the way to Devon, where I discovered that most of the house was shut. The scone was absolutely top-rate though. My tour of the Lake District in March took me to Sizergh Castle, which has been owned by the Strickland family for 800 years. What's even more amazing is that the Stricklands seem to have constantly been on the wrong side of things - Catholic, Royalist, Jacobite - but somehow they retained control of their castle. I can report that they are very much on the right side of things when it comes to their scones. I usually avoid NT gardens at all costs because I always walk around them thinking "I COULD DO THIS AT MY HOUSE!" while forgetting that I do not like mud. 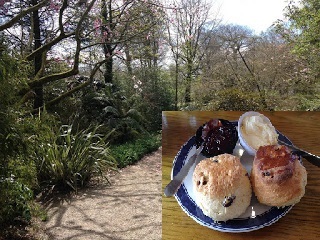 But I'm glad I went to Hidcote - it's a stunning place and the scone was top drawer. Melford must be one of the only NT properties that has a celebrity living there - Chartwell has Jock the cat, but Melford has the original Jemima Puddleduck. Beatrix Potter was related to the Parker family and gave them the duck that inspired her book. And the scone was fantastic. If you spent the 1980s watching TV between 4pm and 6pm, then you may remember Moondial. 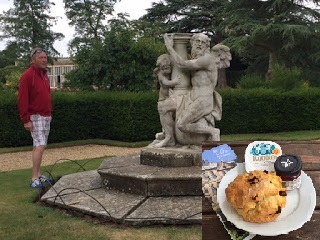 In fact, the TV show and the original Moondial book were both set at Belton House - below you can see the Scone Sidekick admiring the 'moondial' (it's actually a sundial), although he didn't watch TV between 4pm-6pm in the 1980s, so he had no clue what he was looking at. He loved the scones though. If the words 'by a lonely prison wall, I heard a young girl caaaaaa-ling' mean anything to you, then Wallington will probably stir some interesting emotions. It was owned by the Trevelyan family and Charles Edward Trevelyan is name-checked in the song The Fields of Athenry. 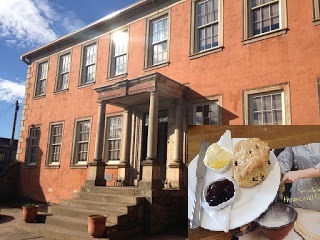 It's a fascinating place and the scone was superb. 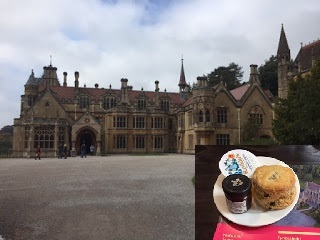 I probably shouldn't keep going on about this, but Tyntesfield was built using the profits from bird poo - the Gibbs family who owned the place had made their money from guano imported from Peru and sold as fertiliser in the Victorian era. Amazing. The scone was (hopefully) a bird poo free area and it was magnificent. 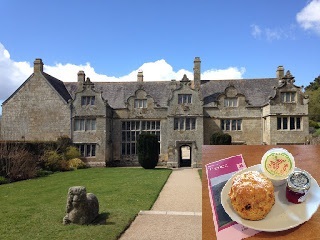 I thoroughly approve of the signs that I noticed at the NT this year saying "we need to replace our roof at a cost of £3m - that's 750,000 cream teas". Obviously I've got an excuse to eat scones, but it's good that everyone else has one too. 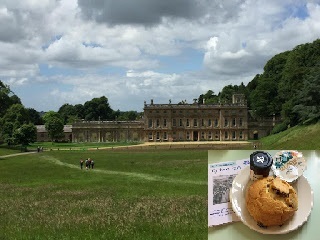 The scaffolding is down at Dyrham now but the scones are excellent, so definitely keep eating. If I had to pick my favourite person who ever owned an NT property, it would be Henry Cyril Paget. If you imagine Freddie Mercury and Noddy Holder rolled into one, but in 1900, then you've got Henry Cyril. He inherited Plas Newydd on Anglesey but ended up bankrupt. You must go there. The scone was excellent too. 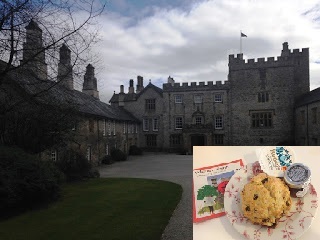 Acorn Bank in the Lake District used to be a haven for pilgrims in the 13th century, so it seemed a fitting place for me to visit on my scone odyssey. 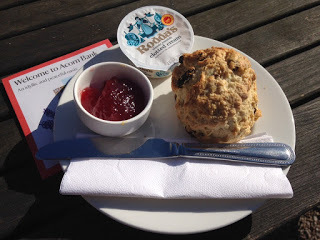 It was a lovely sunny morning and the scone was first rate. 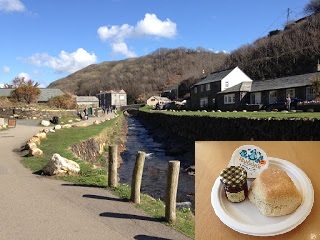 I wandered lonely as a Scone Blogger to Wordsworth House in Cockermouth for a very delicious scone with the best jam of the year. That's three Lake District scones in the top rankings for 2016 - good work, the Lake District. Sudbury in Derbyshire has two attractions; the hall itself and the National Trust Museum of Childhood, with its rather depressed-looking Sooty and the Sindy bathroom that transported me straight back to 1982. Make that three attractions; the Sudbury scone was an absolute triumph. 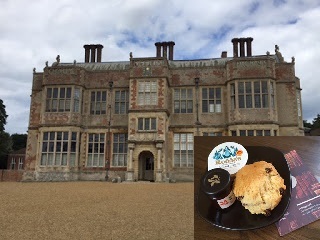 Felbrigg Hall in Norfolk has everything that I love in an NT property - a fascinating history, some shocking scandal, and an outstanding scone. Probably the best single visit I made to the NT this year - I can't recommend it enough. I know, I know, I know. 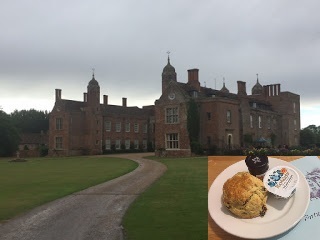 It's a bit cheaty to say that FOUR scones get to be Scone of the Year, but it makes sense if you think about it: a) they would have ranked in places 1-4 and this way other properties get a mention, b) I really couldn't choose between them, and c) I ate them all within a 48 hour tour of the region so they kind of form one giant cream tea? And that's why Cornwall deserves a shout-out. My hit rate for a 5-star scone is around 35%. For me to go to Cornwall, visit 5 properties with scones and award 4 of them an unquestionable gold star is quite an achievement. Well done, Cornwall. Let's name those four outstanding scones. 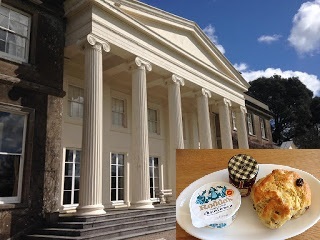 Trelissick - the house may be relatively new to the NT but they've certainly got to grips with baking scones. Delicious. So there you have it. 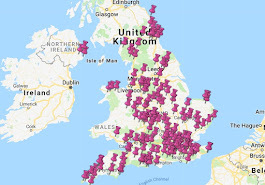 We've now completed 149 of the 260+ NT properties that have tea rooms, so there's still a long way to go. 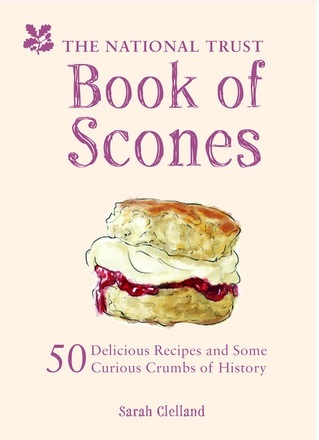 Look out for a new book that will be appearing in NT bookshops in April - it's called Scones of the National Trust and it features some amazing scone recipes as well as some excerpts from this very blog. Thanks again for all of your comments, likes, tweets, and emails - they really help to keep me motivated. I *will* complete this odyssey! 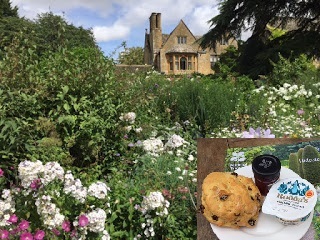 I was going to hire the O2 for this year's National Trust Sconepals' SconePoll Winners' Party, but it would be far too small to accommodate all of us NT scone fans. 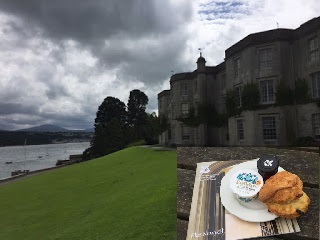 In summary, it has been a very good year for scones at the National Trust - next week I will publish my annual review of the 48 properties that I visited in 2016. But THIS is the countdown that really matters - these are the best NT scones of 2016 as voted for by the public. Every week, Sconepals from around the country share their photos of scone glory, and this is their chance to vote for their favourite. Yes, for the second year running, Speke Hall wins the Sconepals' Scone of the Year. 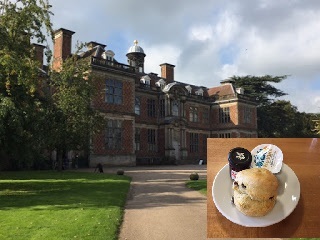 And I'm not going to argue with that; I went there in May 2015 and I absolutely loved it - read about Speke Hall's top-scoring scones. If you're wondering why some of the properties above are marked in gold (alright, orange), these are properties to whom I also awarded 5 stars. On this basis, I think we can conclude that our tastes are aligned - the ones in green I haven't visited yet, so hopefully I'll love them as well. A MASSIVE thank you to everyone that voted - I've had a few ups and downs on this blog this year and you totally keep me going with your pictures and support. Finally, a big well done to all of the properties that got a mention - keep up the good work! And tune in next week to find out who has won the Scone Blogger's Top Scone of 2016! It's going to be close!